As Excel becomes more and more of a reporting tool, it is sometimes necessary to write commentary for the numbers in the spreadsheet. Occasionally you want to make it look like a Word report with bullets in the cell, itemising key points. 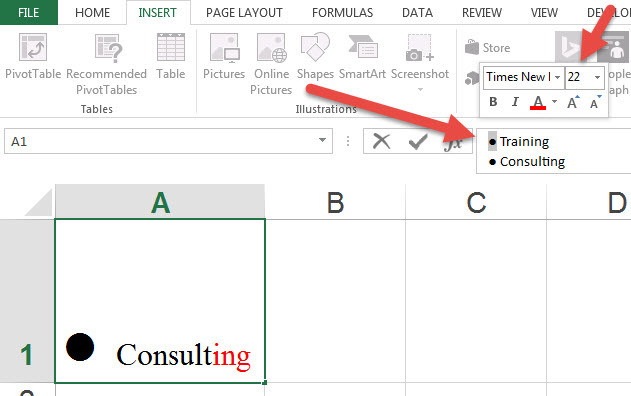 The simplest way is to type a dash (-) before a point, write the text and then click ALT and ENTER to go to the next line WITHIN the cell, or just enter to go to the next cell (learn more about creating paragraphs in Excel by following the link). 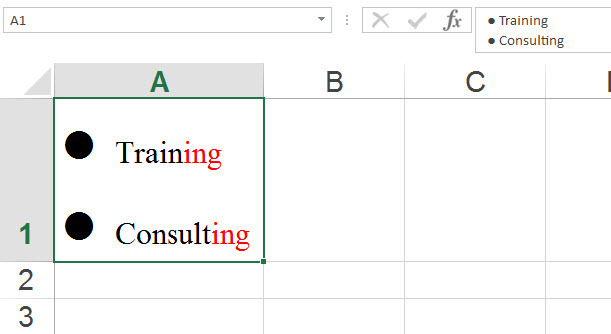 In both cases Excel will not like this, as a dash is the same as a negative sign and Excel will think you are trying to create a formula and give you an error message. There is a simple fix. Put an apostrophe ( ‘ ) in front of the dash. 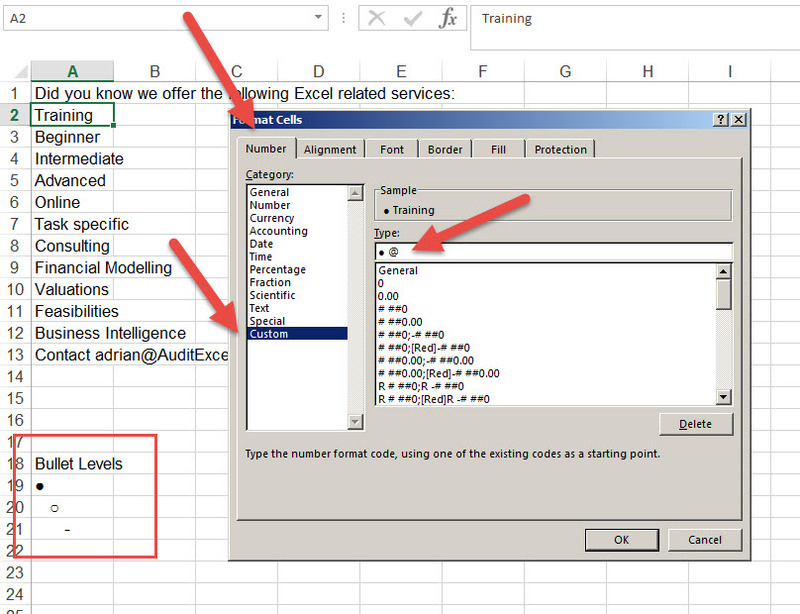 This tells Excel that what follows is text and should not be considered a formula or number. You will see below that although you see the apostrophe in the formula bar, it doesn’t appear in the cell. Dashes are not always the best bullet points so it would be great if you could include other symbols like a dot or similar. The first thing to make sure is that the font is a normal font and the one you want to use. If you scroll down within that font, you will see many different characters and symbols and below we have shown the ones we typically use for bullet points (close to the bottom). Another important point about bullets within a cell is that you can format portions of a cell differently, which means it is possible to have a size 22 bullet in the same cells as text that is size 11. As shown below, if you click in the cell and highlight some text (in this case the bullet point), you get the option just above it to change one of many options including the size, colour, boldness etc. As shown below we have made the bullets very big and then changed the ends of the words to be in red. 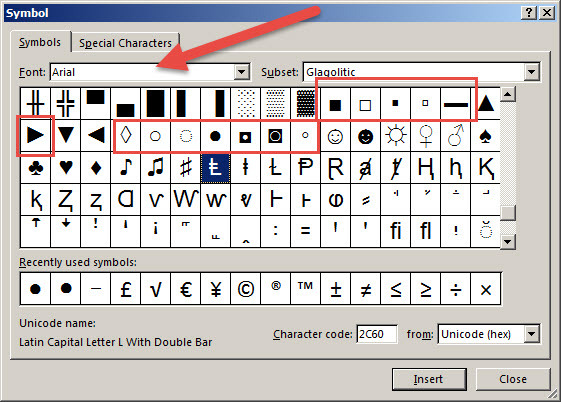 In this way you can at least get closer to the formatting that is possible in Word. 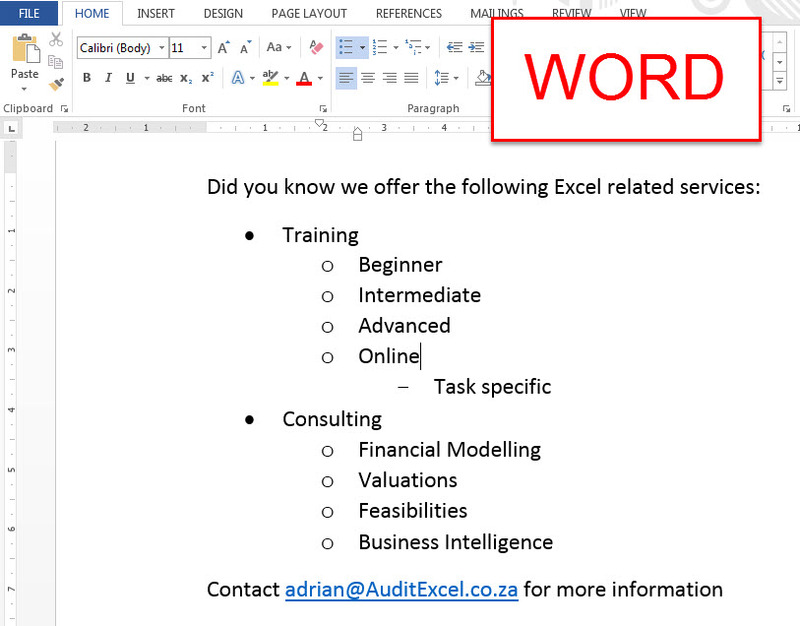 Another way to get the look and feel of word is to actually type it in Word and then copy and paste it into Excel. 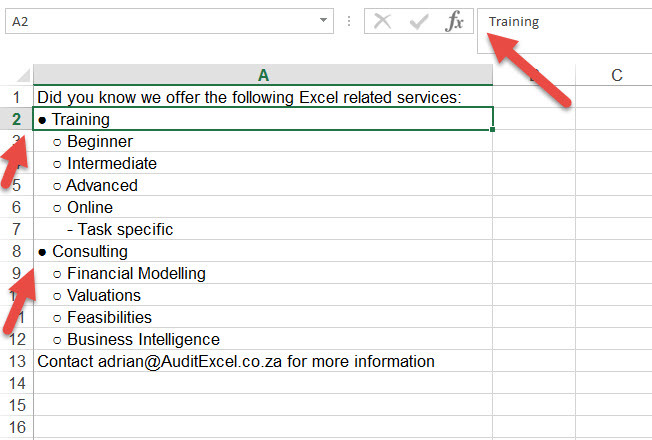 Please note that it is important where you click in Excel. 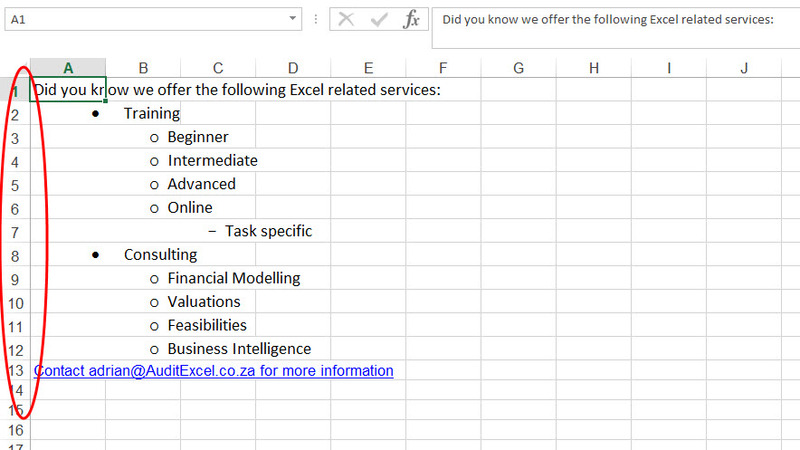 Then if you click ON a cell (so you click on cell A1 and paste) in Excel you will get this. Note that each line is in a new row, so we use up 13 rows here. If you click IN a cell (you click on A1 and then click in the formula bar) you will get this. Note that the entire paragraph is in one cell and the formatting is slightly different. Another option is to create a cell format that always shows a bullet point when you type in it. To do this you need to make use of custom formatting. As shown below, we first recommend you decide what the bullet levels are and put them in some cells with the correct spacing. 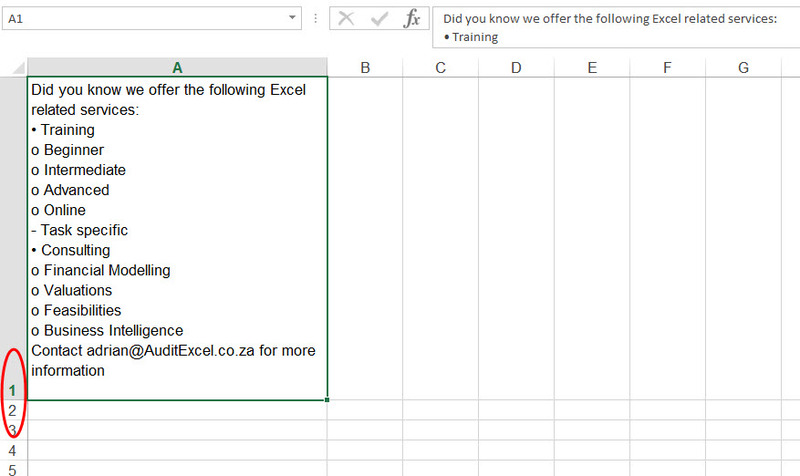 Then copy one of them (copy the contents of the cell, not the cell) and go to Format Cells, Custom. In the Type bar, paste in your copied bullet and put an @ after it (include a space if you want a gap between the bullet and the next word). Now whenever you use that format, you will see the bullet in the cell even though it is not in the formula bar. If you want to indent a bullet type, spaces before the bullet need to be put in inverted commas as shown below, so in the type box we have ” “○ @ which then allows for an indent. The end result will be as shown below. Note that the bullets appear and are correctly indented in the cell, but it is not part of the formula bar. 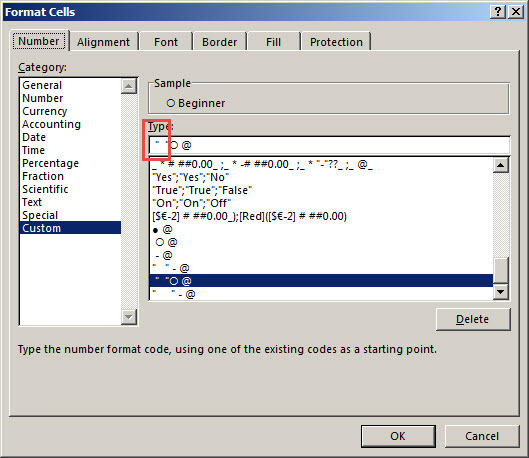 This also means that next time you need a bullet, you can use choose the correct cells, switch on the format painter and paste that format to as many cells as you like.